One of my childhood memories towards the end of Lent (which seemed to last forever) was of the services on the holy days before Easter. The ceremonies called Tenebrae (darkness) featured the extraordinary poetry of the Prophet Jeremiah in the form of his Lamentations. These would be performed on those days by a fairly well-rehearsed choir singing the Gregorian chants. I can’t claim to have been aware of the beauty of the texts back then. Eight years of study of Latin still lay before me. The Lamentations are one of the most poetic books of the Old Testament, apart from the Song of Songs, the Psalms and Ecclesiastes. Essentially, the prophet Jeremiah sees the destruction and desolation of Jerusalem (before it happens) and laments the inevitable catastrophe. Naturally, this great elegiac poetry was used by the Catholic Church in its Holy Week liturgy, not only because of the sorrow expressed therein but as an allegory. 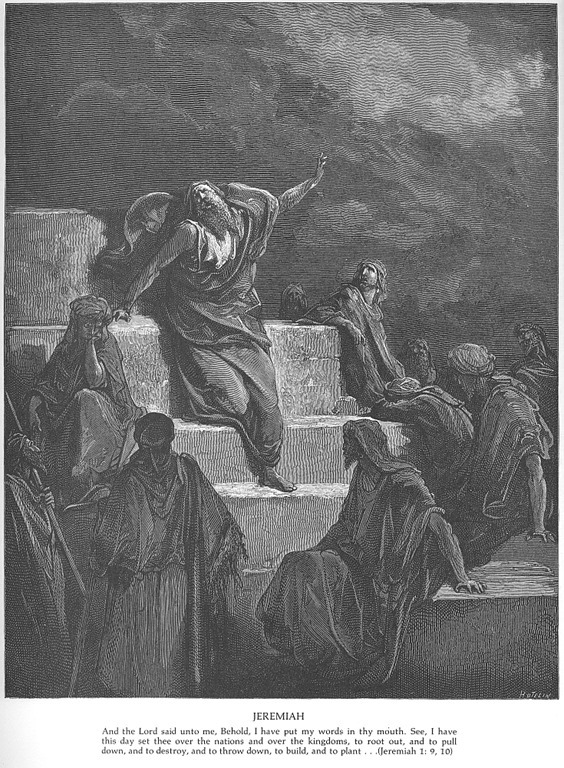 The destruction of the Temple of Jerusalem is seen as the death of Christ, but is also a call to the faithful to repent. The verse “Jerusalem, Jerusalem, convertare ad Dominum Deum tuum.” (Jerusalem, Jerusalem, turn back to the Lord your God,” is often used as a refrain of sorts. 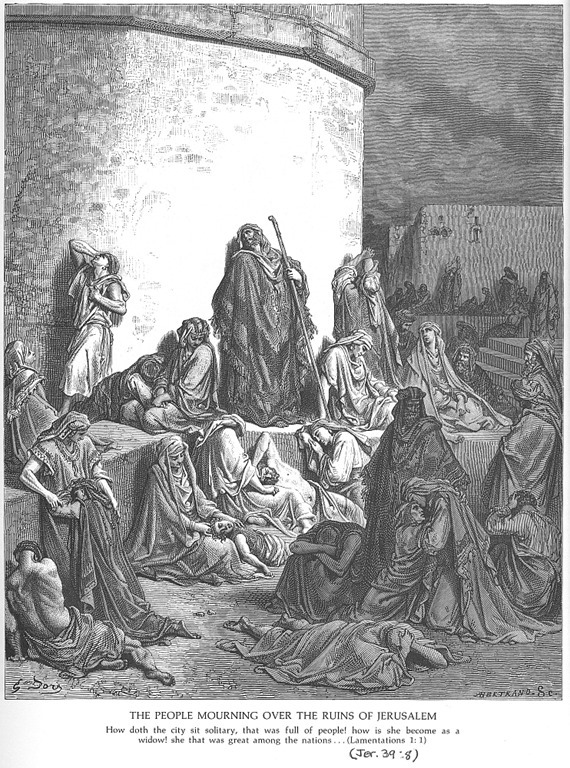 I have provided here three related engravings from the Gustave Doré Bible. 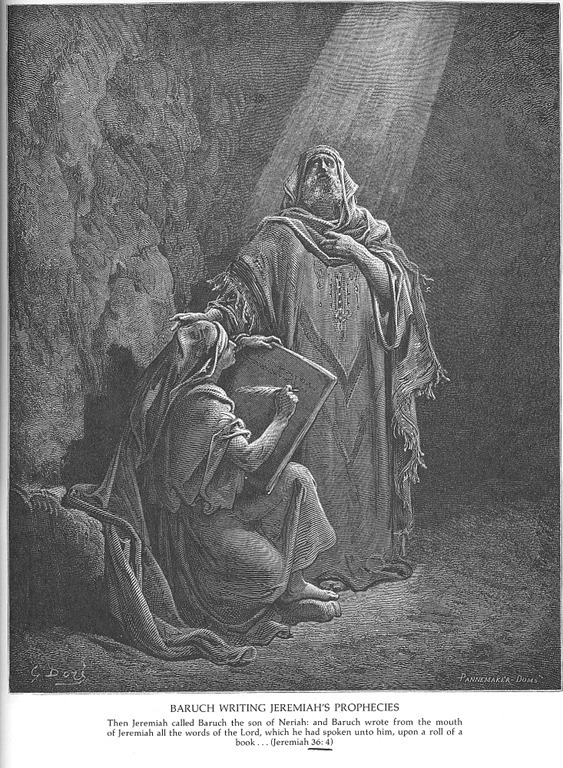 The original paintings or drawings were by Doré, but the fine engravings were done by various journeymen engravers, as was the practice of the day. It was natural that great musicians, especially Catholic ones, would set these texts to the music of their time, and today, irrespective of our beliefs, the music continues to inspire us, especially as Easter and spring are upon us. It is the (necessary) darkness before dawn. If you Google “Lamentations,” or search for Lamentations or Tenebrae on YouTube and you will be able to access some of the extraordinary results. Below, is a partial list of the various settings to the Lamentations that I have collected, most of them from the Renaissance and Baroque periods. Many of these recordings are still available. For a good discography summary, click here (texts in French). I will single out some of the better known settings. There are a number of recordings of the settings by Thomas Tallis (ca. 1505-1585) and the settings are brief enough to provide a good introduction to the genre. There are two sets, and both are presented here. There are also a couple of very beautiful settings by Giovanni Pierluigi da Palestrina (c. 1525-1594) and another by Tomas Luis de Victoria (1548-1611). French Renaissance and Baroque composers seem to have had a particular predilection for the Lamentations texts, and several of them set the words to music. The instrumentation is usually sparse, as befits the Lenten period. There is one double CD set of Michel Lambert (1610-1696) on Virgin Classics featuring the three days (Wednesday-Thursday-Friday) and their Leçons de ténèbres, for soprano, alto, countertenor and tenor, accompanied by a viola da gamba, a theorbo, and keyboards instruments (harpsichord and positive organ). Well over two hours of sublime music, which you should spread over three days, preferably on quiet reflective evenings, if you still set aside the time to enjoy those. Other settings in that time period are also hauntingly beautiful in their own way. The beauty of the vocal writing, however, overrides the expression of any strong emotion. This was the Age of Reason, after all. And one contemporary cleric bemoaned the fact that the liturgical texts were now being offered as mundane and frivolous entertainment. There are curiously no Romantic settings of the Lamentations. I am not sure why. In the 20th century, there were three notable composers inspired by the texts. Ernst Krenek (1900-1991) composed his Lamentations in 1941. I have only heard parts of it. It is a difficult piece, eerily beautiful, returning to the Gregorian now and then but superimposing twelve-tone writing. Leonard Bernstein (1918-1990) subtitled his First Symphony “Jeremiah” (1939-42). Igor Stravinsky (1882-1971) contributed his Threni (1958) — another bit of difficult twelve-tone writing. Last, but certainly not least is the Canadian composer Peter Anthony Togni’s composition Lamentations (2007). It is essentially a lengthy concerto for Bass Clarinet and Chorus. The bits of it that I have heard are remarkable and the composition has received excellent reviews. There is a recording of it, and this will certainly be my next acquisition, and a wonderful addition to my growing collection of Lamentations. Giovanni Pierluigi da Palestrina (c. 1525-1594): Lamentations, Book Four (ca. 1588 or earlier). François Couperin (1668-1733) Leçons de Ténèbres pour le Mercredi Saint (1714). Jan Dismas Zelenka (1679-1745) Lamentations (for all three days) (1722).